Posing for a photo after the culminating ceremony of the small business track training from left are, Dr. Ghirmay Ghebreyesus from the SU College of Business, Tallulah City Alderman Rev. Tommy Watson, Mayor Pro-Tim of the City of Tallulah Nikki Thomas, Dr. Patricia Candler, Dawn Kline, Vicki Gatherite, Patricia Thompson, SU Ag Center FCS Agent Sarah Sims; on the second row beginning on the left are Chris Herring, Madison Parish School Board Representative for District 5 Darrell Sims, Terrance Watson, Dr. Sung No with the SU College of Business, Sharon Rambo, SU Ag Center's Center for Rural and Small Business Development Specialist Eual Hall and standing on the third row is Samuel Johnson. Photo by Chris Rogers. Baton Rouge, LA- The Southern University Agricultural Research & Extension Center and the university’s College of Business held a culminating ceremony to mark the end of their Small Business Track Training series held in Tallulah, LA on July 22. The ten-week series was aimed at boosting the economy of Madison Parish and surrounding areas. Thirteen current and potential small business owners received certificates for completing and attending the trainings which covered the topic of Microsoft Excel, Entrepreneurship, QuickBooks, Target Markets, Contract Procurement, Project Management and Supply Chain Management. Business Development Specialist Eual Hall with the Center for Rural and Small Business Development at the SU Ag Center in collaboration with Drs. Ghirmay Ghebreyesus and Sung Chul No from the Economic Development Administration University Center (EDAUC) in the College of Business at Southern University’s Baton Rouge campus facilitated the trainings along with several guest speakers. 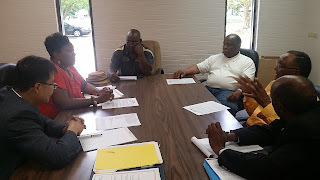 The hope is that the participants will use the information from the trainings to assist them in expanding a current business or enable potential small business owners with the skills to start a small business in Madison Parish are within the surrounding area. For additional information on the Small Business Track Training or how to start a small business, contact Sarah Sims at, 318-574-2465. 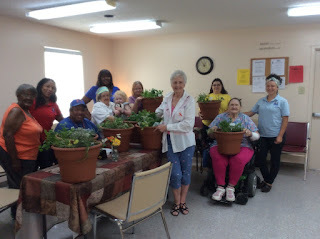 SU Ag Center Nutrition Educator Camellia Brown, standing second from left in the red shirt, nutrition assistant Salette Tennie, standing in royal blue shirt and Extension Associate Stephanie Elwood, standing in light blue shirt on the far right, are pictured with herb garden workshop participants. Herb garden workshop participants plant herbs in a herb bowl during the workshop. Camellia Brown, standing in the center in a red shirt and Stephanie Elwood, standing in the center with a light blue shirt, pose for a photo with herb garden participants and their person herb bowls. 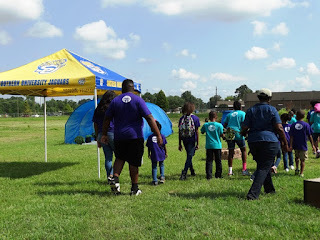 Baton Rouge, LA- Southern University Ag Center Nutrition Educator Camellia Brown, Nutrition Assistant Salette Tennie, and Extension Associate Stephanie Elwood came together to teach nutrition education learners how to make healthier food choices by using more herbs in their foods. 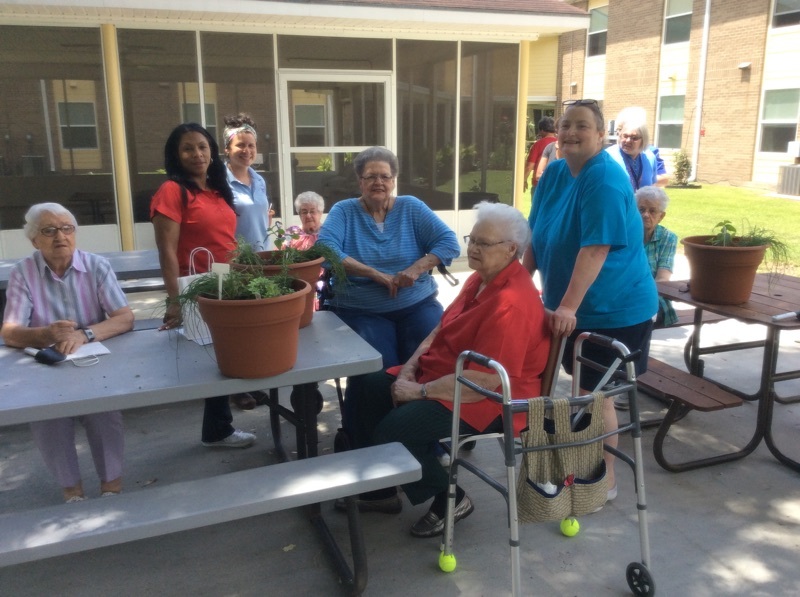 Brown and Tennie taught the nutrition education classes in May at Chateau des Amis, Village De Memoire and Savoy Heights Senior Residential sites in Ville Platte, LA. 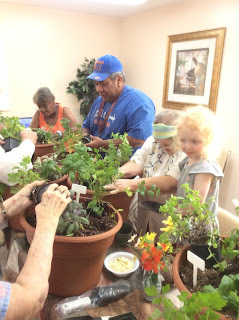 To enhance the nutrition education and incorporate some hands on activity, the seniors participated in a workshop on how to grow their own culinary herbs. Each senior participant left the herb workshop with their own personal herb bowl to be grown inside or outside of their apartment. The herbs included parsley, mint, thyme, green onions, sage and more. These herbs are perennials, which means they will come back year after year and don’t need to be repurchased or replanted, and can be grown in small spaces. 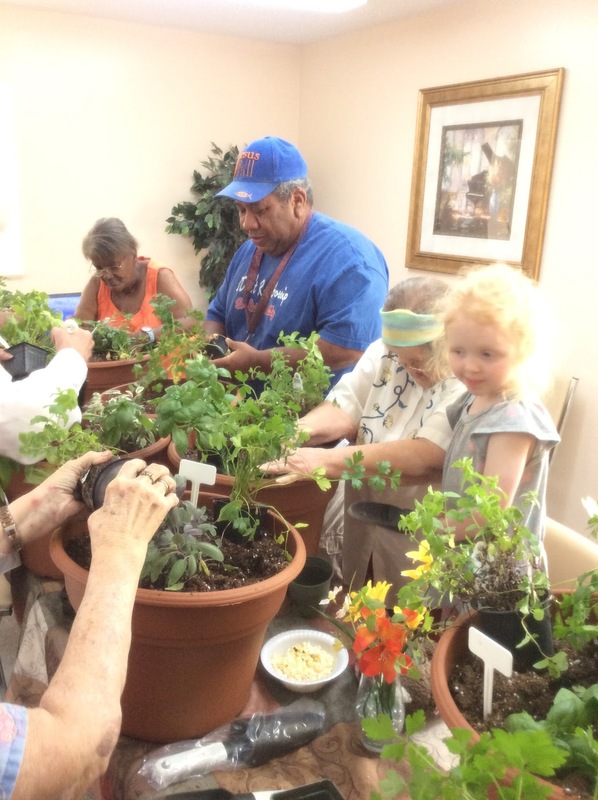 With each senior planting and maintaining their own herb bowl, this ensures constant availability to healthy fresh herbs that can be used in meal preparation. For more information about the SU Ag Center’s Nutrition Education Program in Evangeline Parish contact, Camellia Brown at (318) 964 2249 or camellia_brown@suagcenter.com. The IFT Annual Meeting & Food Expo is the only annual event that brings together the brightest minds and the most respected food professionals from around the world in industry, government, and academia. Present at the meeting were trendsetters in product development, senior-level executives from the world’s top food companies, and department heads from leading universities. Participants gained technical and applied food science knowledge; connected with the who’s who in food science; discovered the latest global trends and the newest innovations; identified new suppliers and met with current ones, choosing from more than 1,000 exhibiting companies. This year’s IFT themed “Where Science Feeds Innovation,” was held July 11-14, 2015, in McCormick Place South Chicago, IL. 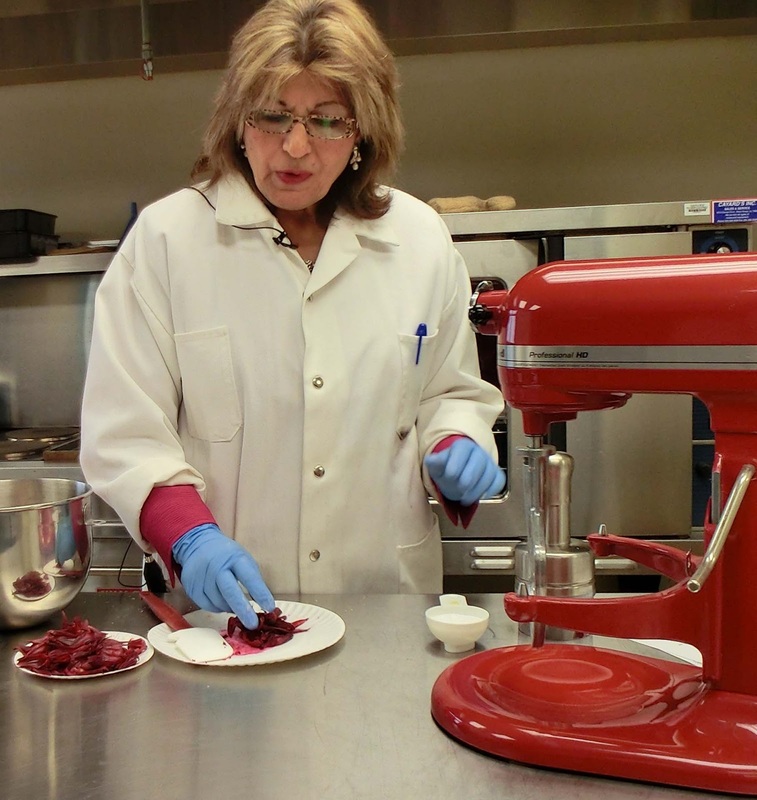 The Institute of Food Technologists is an organization with over 20,000 members. The IFT Student Association (IFTSA) is a forward-looking, student-governed community of IFT members. From left, Rica Trigs, BOLD participant Leisha Cousin, SU Ag Center Extension Assistant Dana Isaac, BOLD participant JaLesia Cousin, Meagan Callier, Briana Wilson, and Kyra Turner pose for a photo after the Teen Summit on July 11 in Madisonville, LA. RolesModels of Hope co-founder JaLesia Cousin, standing far left in white, takes a photo with youth and speakers following the Teen Summit held on July 11 as part of the Building Opportunities through Leadership Development (BOLD) curriculum. 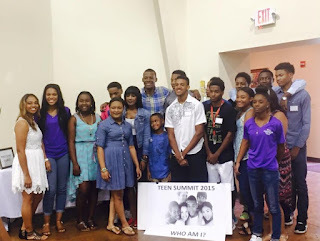 Baton Rouge, LA- Self-confidence, empowerment and knowing your self-worth were the resounding themes of the 2015 Teen Summit held at the Historic St. James Baptist Church in Madisonville, La. on July 11. More than 40 teens attended the summit, which was co-sponsored by the church and RoleModels of Hope, a non-profit organization established to empower young women to make better life decisions through self-development trainings. SU Ag Center’s Building Opportunities through Leadership Development (BOLD) Project participants JaLesia and Leisha Cousin are the co-founders of the RoleModels of Hope organization. “BOLD has provided us with the skills needed to make the dream of starting a non-profit organization a reality,” said JaLesia Cousin. “The BOLD project has developed our leadership skills to enable us to positively impact the lives of both young women and young men in St. Tammany Parish,” said Leisha Cousin. Southern University Ag Center Extension Assistant Dana Isaac attended the summit and was awed by the presentation. 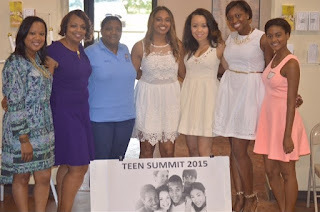 “The Teen Summit was inspiring, heartfelt and uplifting. There were a number of speakers on the program; all of them did extremely well. The three that stood out the most were host, JaLesia Cousin, Rica Trigs and Meagan Callier. Their stories were powerful, insightful, useful to teens in high school as well as those entering their freshmen year in college,” said Isaac. “The teen summit was a blessing to me. 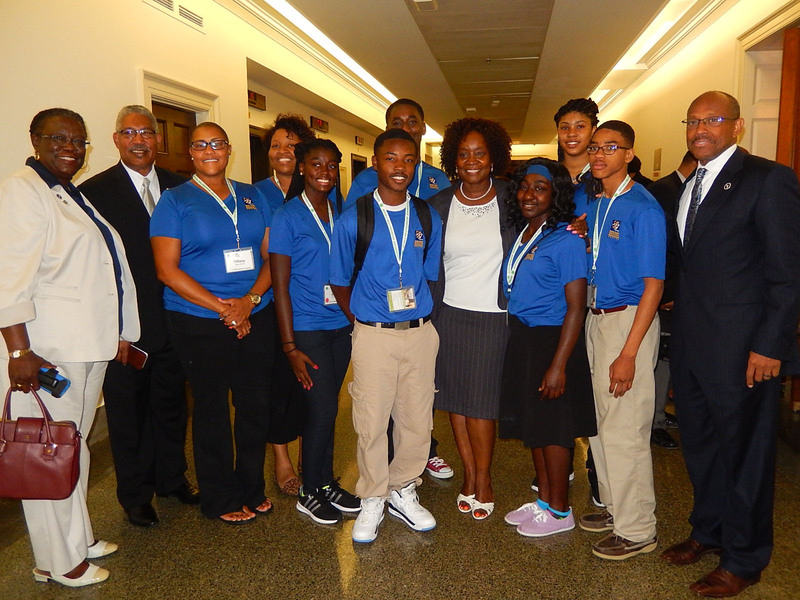 I encourage the Cousins to continue their work with young people in the community. I was happy to be a part of their successful event,” she added. The BOLD Project is an evaluative and technical assistance project designed to develop teams of emerging leaders who work together across racial, class and community boundaries in innovative ways to promote community and economic development in rural and under-served communities throughout Louisiana. The project was developed by SU Ag Center’s assistant specialist of community and economic development, Dr. Kenyetta Nelson-Smith. BOLD participants are required to develop new community projects or enhance existing projects throughout the duration of the course. The Project is now accepting applications for the 2015-2016 session. Classes will begin on Saturday, October 17, 2015 for registered participants. Interested candidates should submit an application form via email to kenyetta_smith@suagcenter.com or print and mail to: Building Opportunities through Leadership Development. P.O. Box 10010, Baton Rouge, LA 70813. For additional information about the BOLD Project, visit http://suagbold.org/insidebold.html. 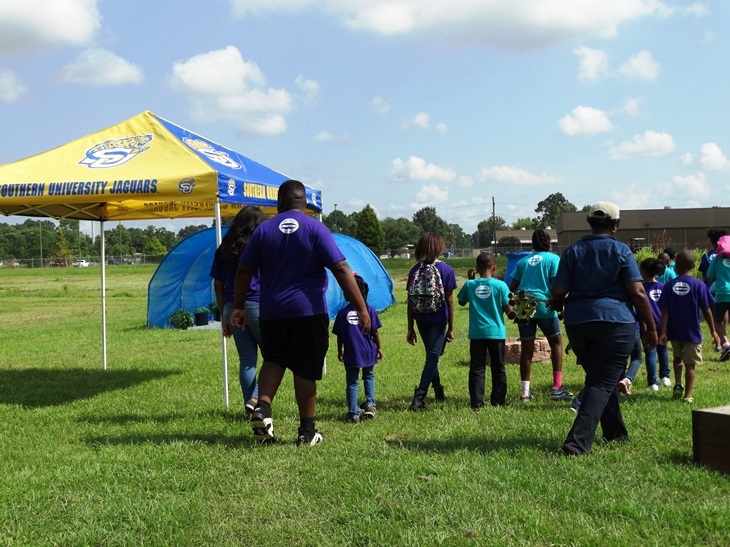 The purpose of the Building Opportunities through Leadership Development project, developed by the Southern University Agricultural Research and Extension Center is to improve the leadership development capacity of rural and under-served communities throughout Louisiana. BOLD is an evaluative and technical assistance project designed to develop teams of emerging leaders who work together across racial, class and community boundaries in innovative ways to promote community and economic development. BOLD is a pilot project of the Southern University Agricultural Research and Extension Center’s Community and Economic Development Office to improve the leadership and economic development capacity of rural communities throughout Louisiana. Leadership Introduction; Leadership; Team-building; Community Vision and change; Group/Organizational Leadership Skills; Community Assessment; Motivation; Communication; and Conflict Management. Vision: to provide Louisiana residents with the tools and knowledge necessary to become stronger, equipped leaders in their communities. Goals: Through extensive training, exercise, skill development, and individual and group activities, BOLD participants have the opportunity to effectively and efficiently develop leadership roles in their community through a logical approach. BOLD also enables individuals to apply learned leadership skills and principles to individuals and issues in the community, and develop teams of community residents who can work together to address community concerns. Pictured from left are, Beatrice Cummings, Dr. Ghirmay Ghebreyesus and Dr. Sung No, both from the SUBR College of Business, Town of Ferriday Alederman Elijah Banks, Eual Hall with the SU Ag Center and Ferriday Mayor Gene T. Allen. Members of the Southern University Ag Center and the College of Business held a meeting with Ferriday Mayor Gene T. Allen to introduce a 10-week business development training for small business owners. Baton Rouge, LA- Eual Hall, Business Development Specialist in the Center for Rural and Small Business Development at the SU Ag Center, and Drs. 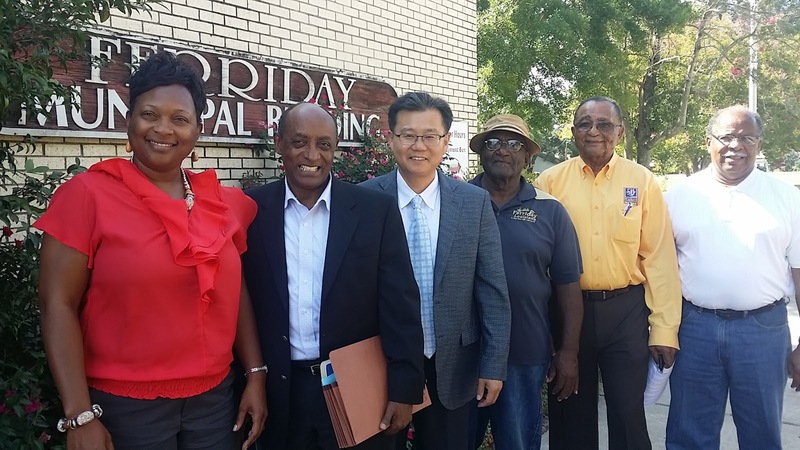 Ghirmay Ghebreyesus and Sung Chul No from the SU College of Business held a meeting with the Town of Ferriday Mayor, Gene T. Allen and members of the town’s council on July 22 to introduce a small business development series. The 10-week training series, called a small business track training, will focus on small business development, record keeping and Microsoft Excel. These trainings are being proposed as a means to boost the economy of Ferriday and surrounding areas. For additional information, contact Mr. Hall at 225.771.4105. Baton Rouge, LA - Tiffany Franklin, a 4-H state Citizenship Washington Focus Coordinator at the SU Ag Center accompanied a delegation of six youth to the 2015 CWF in Washington DC, July 12-18. Four of the youth represented East Baton Rouge Parish and two St. Landry Parish. The National 4-H youth who attend the CWF program are usually selected by 4-H state or county coordinators. Citizenship Washington Focus is a week-long 4-H citizenship program for youth ages 14-19. CWF provides opportunities for young people to: Strengthen communication, leadership and other citizenship skills on a national level; Understand the importance of civic and social responsibilities as they relate to the development of better citizens and leaders; Exchange ideas, practice respect and form friendships with other youth from diverse backgrounds. Franklin can be reached at 225-771-2242. Southern University System Celebrates 125th Anniversary of the Signing of the Second Morrill Act With Other 1890 Land-Grant Universities in Washington, D. C.
Southern University System President/ Chancellor Dr. Ray Belton, standing second from far right, poses for a photo with the presidents of the 1890 Universities in Congress' Agriculture Committee Chamber. Southern University Ag Center Vice Chancellor for Extension Dr. Gina Eubanks, SU System President/ Chancellor Dr. Ray Belton, SU Ag Center 4-H Life Coordinator Tiffany Franklin, Director of the SU Ag Center's Southwest Center for Rural Initiatives and Youth Specialist Dr. Wanda Burke and SU Ag Center Interim Chancellor Dr. Adell Brown take a photo with the youth participating in the 4-H Citizenship Washington Project. Individuals visit the Southern University Ag Center display during the 1890 University Exhibit on July 15 in the Madison Building of the Library of Congress in Washington, D.C.
Baton Rouge, LA- Southern University System President/ Chancellor Ray Belton and several members of the SU Ag Center and Baton Rouge campus participated in the Capitol Hill celebration of the 125th Anniversary of the Signing of the Second Morrill Act of 1890. This Act created land-grant universities for African-Americans. 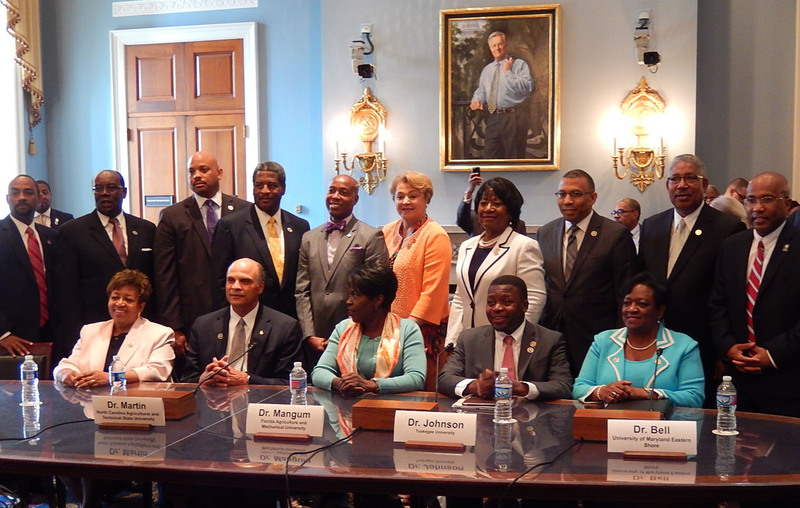 The celebration, which was held in Washington, D. C. from July 14 – 16, 2015, provided an opportunity for the presidents of the 19 Historically Black land-grant universities to testify before congress on the accomplishments and importance of each institution. The universities also participated in an exhibit displaying their campus academic, research, and outreach program offerings. The event concluded with a convocation in the Coolidge Auditorium of the Jefferson Building in the Library of Congress. Convocation speakers included U.S. Department of Agriculture Secretary Thomas Vilsack, U.S. Congresswoman Alma S. Adams, and U. S. Department of Agriculture’s Food and Nutrition Service Administrator Audrey Rowe. Carolyn Robinson, SU Ag Center's Associate Area Agent of Family and Consumer Sciences in East & West Carroll and Morehouse Parishes was elected President of the Louisiana Extension Association of Family and Consumer Science. 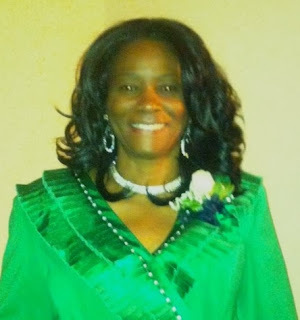 Baton Rouge, LA- Southern University Ag Center’s Carolyn Robinson, Associate Area Agent of Family and Consumer Sciences in East & West Carroll and Morehouse Parishes, has been elected President of the Louisiana Extension Association of Family and Consumer Sciences (LEAFCS). Robinson was installed as president-elect of the association during its Annual Convention held at Hotel Mazarin in New Orleans, May 4-6. The LEAFCS is a Louisiana State University organization which empowers Extension educators to enhance their leadership skills, effect change, and focus on professional development. It is the Louisiana affiliate of the National Extension Associate of Family and Consumer Sciences (NEAFCS). Its mission is to educate and provide recognition to Extension professionals who positively impact the quality of life for individuals, families and communities where they live. Robinson will serve a one-year term beginning in May 2016. 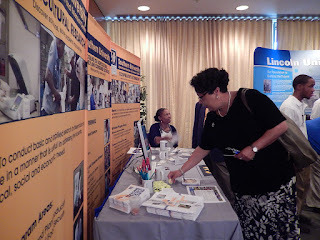 For additional information about the Louisiana Extension Association of Family and Consumer Sciences, visit http://www.lsuagcenter.com/en/administration/about_us/professional_organizations/leafcs/. 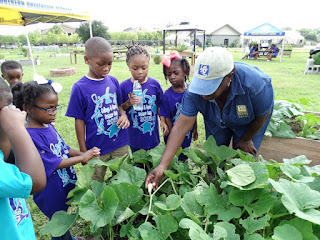 Baton Rouge, La - The Southern University Ag Center opened its door to summer campers from the Jewel Newman Community Center for a tour of the model garden on July 10, 2015. Chaperons from the Community Center brought 21 youth enrolled in their summer camp, ages 5-13, for a visit to the Southern University Ag Center’s Sustainable Urban Agriculture Demonstration Farm. The youth enjoyed the model garden with a show and tell tour presented by Zanetta Augustine, associate extension specialist. An excited group of young boys and girls explored, touched and talked about vegetables, chickens, rain water tanks, composting bins and even trying their hands at planting seeds in the greenhouse, among other educational questions and discussions. They went home with a bag of informational goodies from the SU Ag Center. The Jewel J. Newman Community Center functions as the focal point of social, medical and recreational activities for citizens in the North Baton Rouge area. The Southern University Ag Center’s Sustainable Urban Agriculture Demonstration Farm is a show-and-tell garden is for the public. This educational garden gives information on vegetable varieties, planting instruction, composting techniques, and other relevant information. Farm tours are available throughout the year. The garden is maintained and nurtured by Dawn Mellion-Patin, PhD, Extension Specialist, and Zanetta Augustine. To schedule a tour, please contact Dawn Mellion-Patin or Zanetta Augustine at the SU Ag Center by calling 225-771-2242. 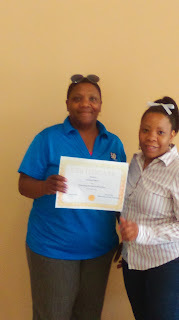 Dana Isaac, SU Ag Center Extension Assistant, receives a certificate of appreciate from Shatonda Chandler, Family Advocate of the Prescott Early Head Start, after making a presentation on the Youth Organizing Leadership Opportunities (YOLO) Program on June 24, 2015. 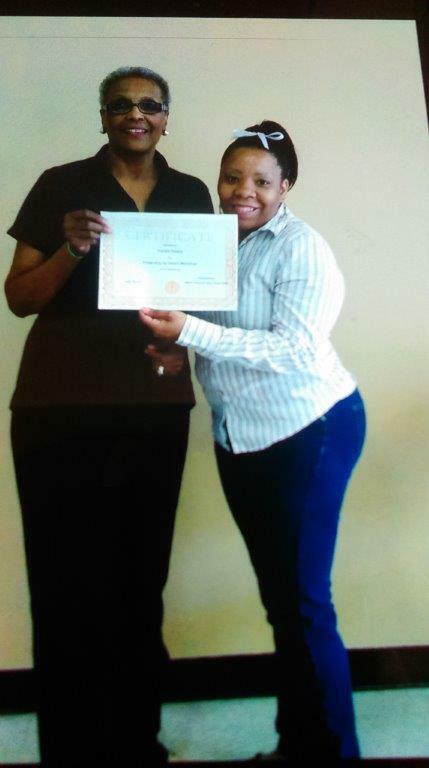 Communities of Color Network Regional Coordinator, Frankie Poland receives a certificate of appreciate from Shatonda Chandler on June 24 after speaking to the school's parents about the dangers of second-hand smoke. Baton Rouge, LA- Southern University Ag Center employees Frankie Poland and Dana Isaac made presentations during the Monthly Parent’s Meeting of the YWCA Prescott Early Head Start, 5262 Prescott Rd., on June 24, 2015. Poland, who is the Regional Coordinator of the SU Ag Center’s Communities of Color Network, discussed the dangers of second-hand smoke and provided examples of how non-smokers come in contact with it; such as being in a room with someone who is smoking or in a vehicle. She also listed all the harmful chemicals found in cigarettes and explained how smoke can linger in carpets, drapes, clothing, hair and other items. Isaac, who is an Extension Assistant for the SU Ag Center, made a presentation on the Youth Organizing Leadership Opportunities (YOLO) Program, which helps young people make better choices; teaches parents stress triggers for youth; behaviors parents should be aware of and tips for teens on how to cope with stress. The parents and staff that were in attendance were very engaged and asked many questions. They also received information on second hand smoke and tips on how to help teens cope with stress. Both Poland and Isaac were presented with Certificates of Appreciation by the YMCA staff. Frankie Poland can be contacted at 225.771.6237 for information on the Southern University Ag Center’s Communities of Color Network. Dana Isaac can be reached at, 225.771.3902 for information on the Youth Organizing Leadership Opportunities Program.